A must visit spot when travelling in Sorrento Area is the outstanding Amalfi Coast. Charming villages and marvellous landscapes are the frame of one of the most beautiful areas of the entire world. Main attractions are the villages of Positano, Amalfi and Ravello although our professional English Speaking drivers will show you secret spots that you only experience if with a local. 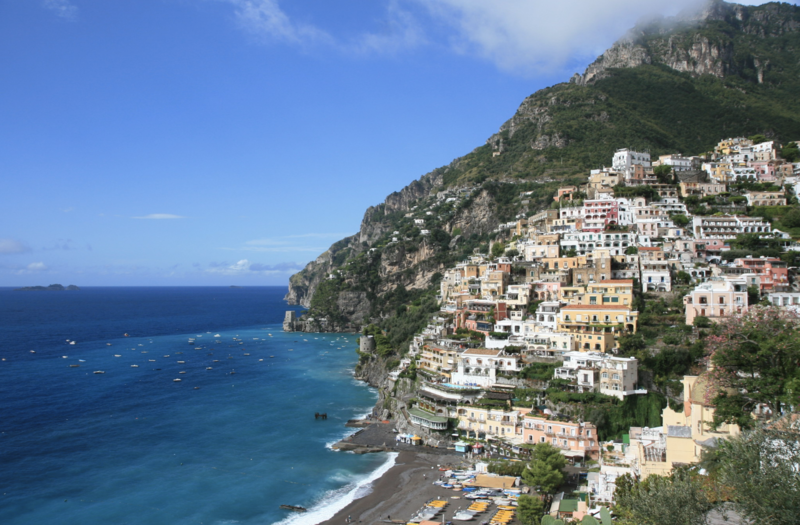 Drive to the Amalfi Coast passing through Sorrento hills surrounded by lemon trees gardens and expanses of olive trees. When approaching the Amalfi Coast the driver will stop at unique viewpoints for the photo lovers, where you can enjoy the view of the entire coast, and the famous Li Galli Islands, private tiny islands off Positano Bay. First stop Positano for 1 hour where you can explore the characteristic and colourful narrow streets of the village with the famous Italian linens Boutiques. Before approaching Amalfi you will pass through the lovely village of Praiano with its stunning views of the Coast and Furore Fiord, the most famous creek of the entire area. This spot is famous because divers from all around the world come here for the Red Bull Challenge. Second stop Amalfi for 1 hour. You can enjoy walking through the old town and visit the famous Sant’Andrea’s Cathedral also called Duomo di Amalfi built in the IX century with its incredible facade and architecture. Other attraction you can visit is Museo della Carta. Recommended a stop for a coffee at Pansa an old-fashioned bar just in the main square. Third stop the lovely town on the hills, Ravello for 1 hour. Before approaching it the driver will suggest you some local Trattorias where you can have your lunch, although you can pick your own restaurant. Totally recharged after your meal you will be ready to explore the third destination of the itinerary: recommended is a visit to the fantastic gardens of Villa Rufolo and you cannot miss a walk through the charming streets and the main square of the town. The driver will take you back at the property after the 8 hours tour. 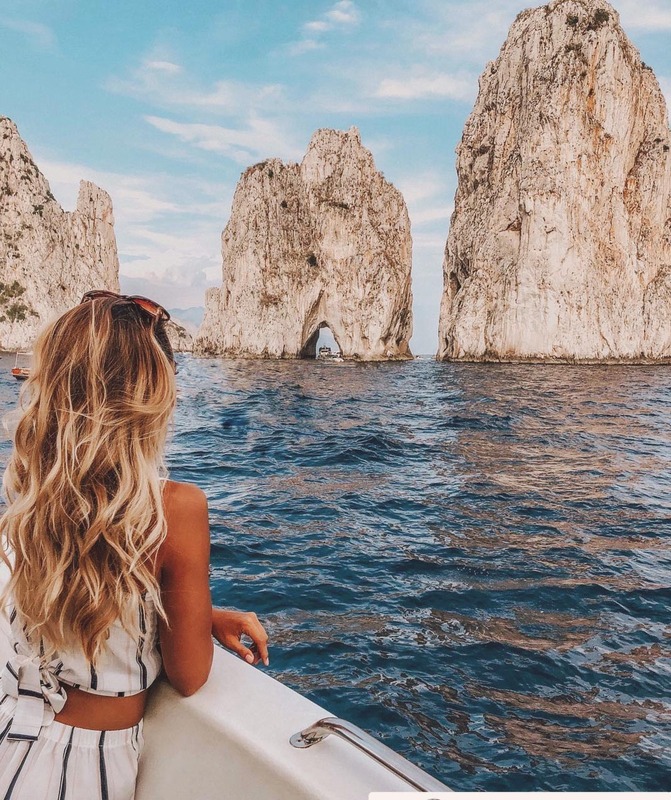 Capri is one of the most famous and most visited Island in the world, renowned for its beauty, colours and naturals attractions such as the famous Faraglioni, big rocky cliffs, and innumerable grottos characterized by light games, as the well-know Blue Grotto. Nicknamed as the Island of Dreams, for its temperate weather, disarming beauty and stunning views it is full of history and culture as well. Capri is a must if you’re coming here, you can’t let it go. This tour gives you the possibility to visit the island by yacht with your friends or lover; there will be a maximum of 12 people on the yacht. The skipper is my personal trustworthy and experienced skipper that will take care of you during the journey and will accommodate any of your requests. Pick up at the property at 09.00 a.m.
Departure will be from Sorrento Port at 09.45/10.00 a.m. Engines are ready.The skipper that is a guide as well will welcome you on board. Once left the Port of Sorrento you will find yourself in the middle of the Gulf of Naples surrounded by a stunning and unique view. We suggest to have the camera ready and take the first photos. First stop is at the Regina Giovanna’Baths, the magnificent ruins of a Roman Villa and a natural swimming pool that stand at the end of a scenic spot. Sail continues passing through the Bay of Puolo where a fisherman village is and just behind the coast of the bay you will find the second stop of the journey a Natural Waterfall. The bravest will have the opportunity to enjoy the very cold shower. The bow points Capri then and the skipper will sail towards the island for about 15/20 minutes. During the sail you will enjoy the island from about some miles away. Cameras ready. Once approached Capri the tour will start from the famous “Salto di Tiberio” a promontory from where the Roman emperor Tiberius threw his enemies to the several beautiful grottos. You will visit first the Coral and White grottos first. Skipper will stop for a swim in a turquoise water bay; he will provide lifejackets and snorkelling equipment. You will then pass through the worldwide famous Faraglioni Rocks before heading to Gioioa Beach club. Here you will have your light lunch and once ready you will start your 3 hours freetime tour on the island. Back on board of the yacht there is time for a refreshing swim in the crystal waters and for a Limoncello taste made in Sorrento. Journey continues with the visit of the green grotto, the lighthouse and the famouse Blue Grotto. The business is managed by local people therefore price of the entrance is not included in the price. If you want to get kindly coordinate it with the skipper. Ticket costs 15€/adult. Skipper will then sail back and arrival at Sorrento Port is estimated between 5/5.30 pm. We suggest big groups to go for a private tour. Advantages are: more convenient money wise, flexibility as you don’t have to follow a schedule, privacy. You can add a sunset experience for enjoying the most magic moment of the day in a fabulous scenario either to surprise your partner for a special occasion or to celebrate a birthday. 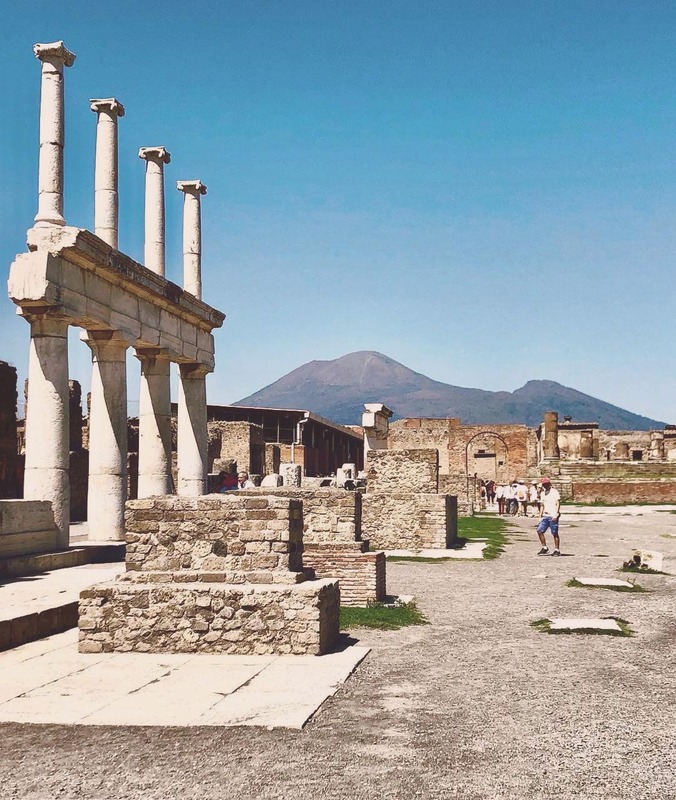 A dive into the past: this is what a tour in Pompeii and Herculaneum is. More precisely in 79 b.C. due to the eruption of the Vesuvius, both cities were totally covered by lava and ash. Everything has been preserved in such a perfect shape that today walking through the ruins feels like you are living moments of the life back in the Romans age. You can visit stunning roman Villas with magnificent mosaics, Temples, Thermal Baths. A pleasant break at a lovely vineyard at the bottom of the Vesuvius is recommended for a tasteful lunch break with local products and a wine tasting. You can combine below 3 activities as you like. The Private Tour offers the possibility to travel with all your family and friends in a comfortable and elegant Mercedes E class Van 8 seats. In addition to above we also suggest to have a full immersion into the Ancient Roman life and culture experience to combine a 1hr visit to the ruins in Herculaneum. The site is far only 20 min drive from the vineyard. Herculaneum is another beautiful and important spot to visit when you come here. As Pompeii, this city was totally covered under 20mt of lava at the moment of the erupting and every item, mosaic or furniture is preserved as 2000 years ago. There were found more than 300 corpses buried under the mud and this has enabled the discovery of precious jewels as gold necklace, bracelets and rings with symbols and divinities which were usually wore by matrons. Same as per Pompei you can hire a private guide. After the tour you will then taken back to your property. We offer any kind of transportation in Italy. Here below list and prices of the most common. 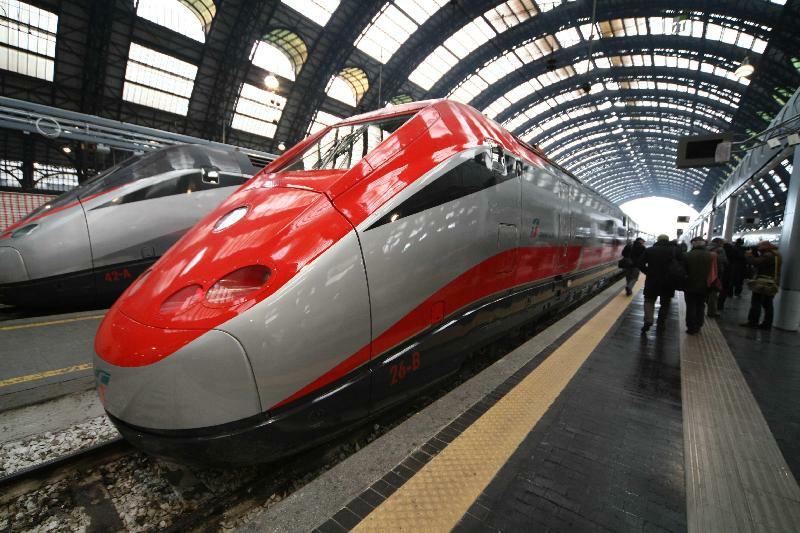 We suggest to get ride from Napoli (Train station, Airport or city centre) in order to avoid the uncomfortable and not very safe Circumvesuviana a local train that connects Napoli train station to Sorrento station or the very often slow bus that connects Napoli Airport to Sorrento. We have our own drivers and this is the reason we have the best available prices on the market for single passengers and couples as well as for families and groups. They will give you a very warm welcome and will share with you basic information on the area. You can request a stop along the journey to take photos of the stunning view you will get through.